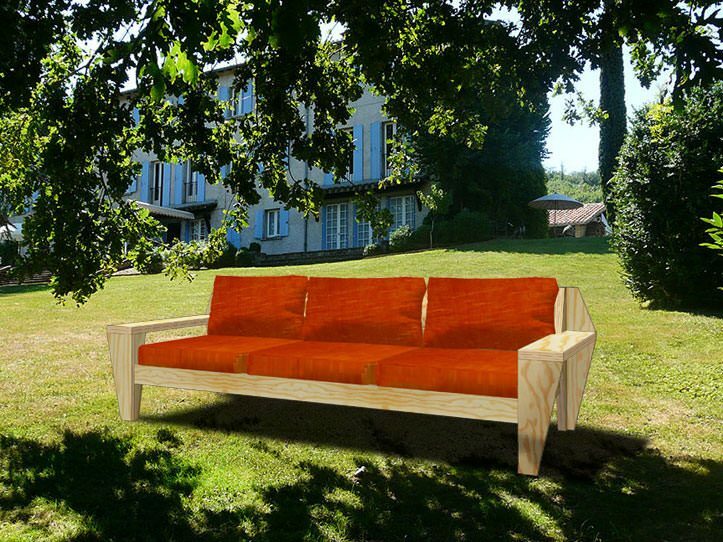 The furniture plan of lounge sofa Yelmo describes the three-seater version of this bench. With the blueprints, diagrams and cutting list you can quite easily make a two-seater or other variant. 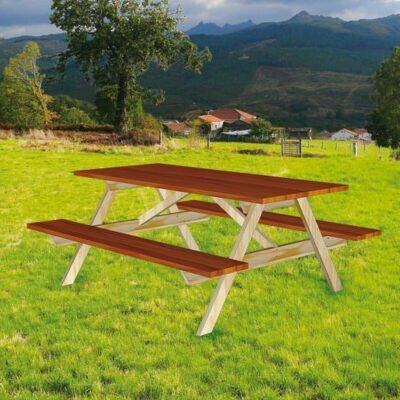 The size of the seat cushion is 65 x 65 cm, the back cushions measure 65 x ± 35 cm. Ikea has/had(?) lounge cushions in this size. Or you can make them yourself, or order them made to measure. You might find some producers on the internet. 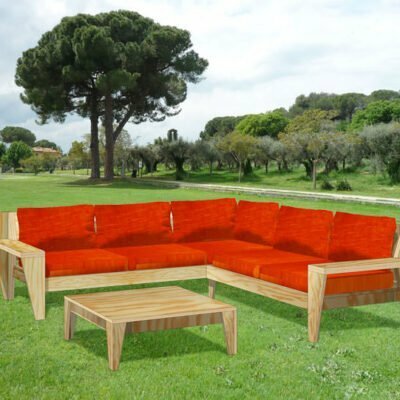 As a material for this design outdoor furniture, we recommend plywood: for example, birch or pine plywood. 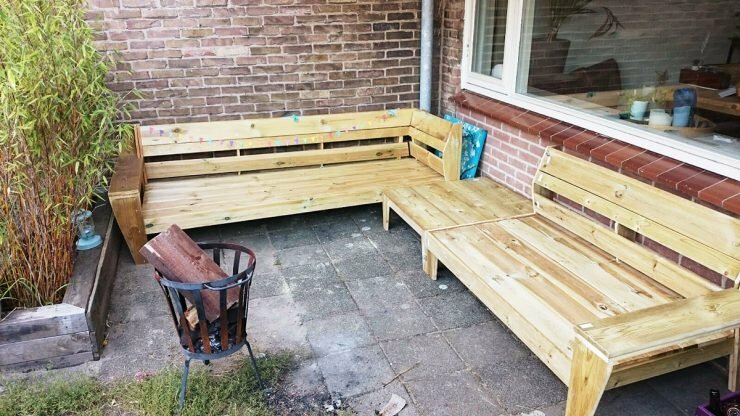 You can also use old scaffold planks, but then you’ll have to make a few calculations and adjustments to account for the slightly different thickness. To cut the panels, we recommend the use of a circular saw. You can usually ask your wood supplier to do this for you..
We have naturally tried to make the design as beautiful as possible. For this lounge sofa, we have taken particular account of a few things. We have tried as far as possible to hide all screws. For screws that remain visible, you’ll find instructions on how to camouflage them. 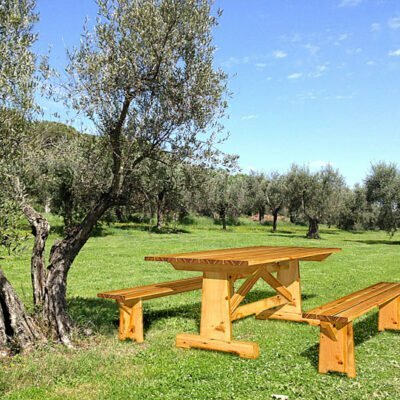 We also describe how to make connections with dowels in some places, so you do not need screws at all. If you want to paint the sofa, you can neatly hide any remaining evidence of screws with help from some filler. 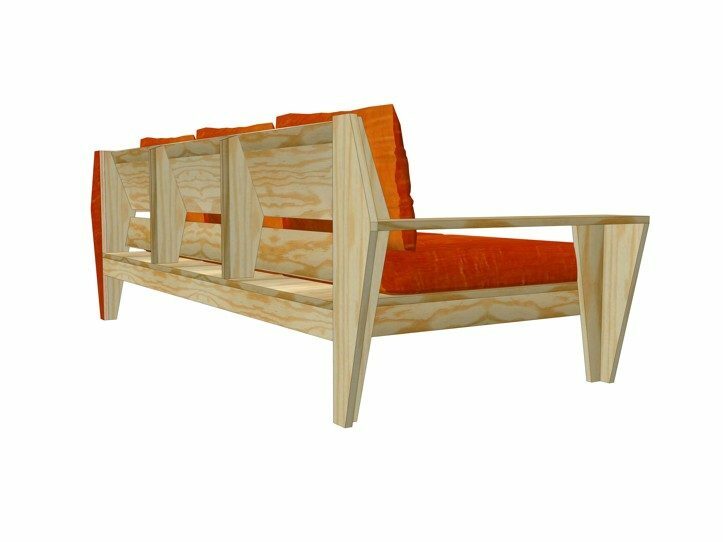 In our furniture makers tips we describe how you can do this. 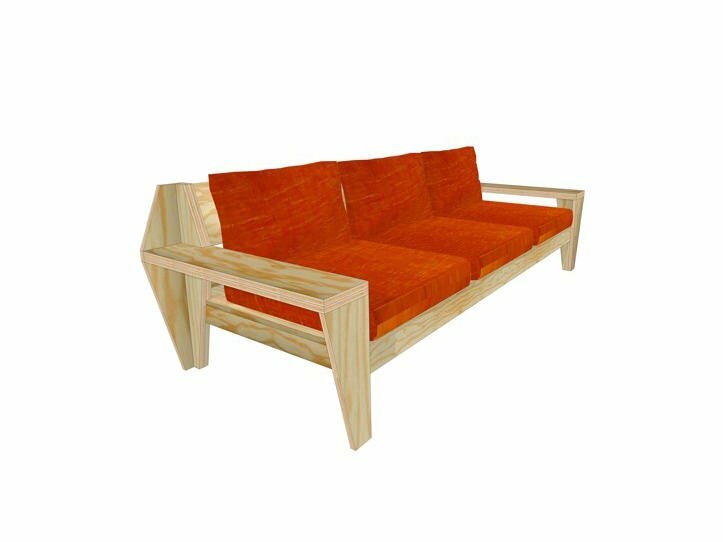 We always try to make our furniture as efficiently as possible from standard size sheet or board material. 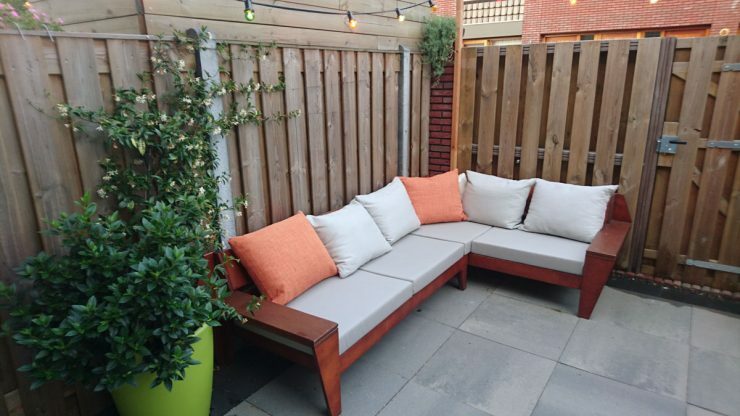 Outdoor sofa Yelmo (three-seater) can be made from two standard 122 x 244 cm sheets. The downloadable manual is in the form of an A4 booklet for you to print out yourself. 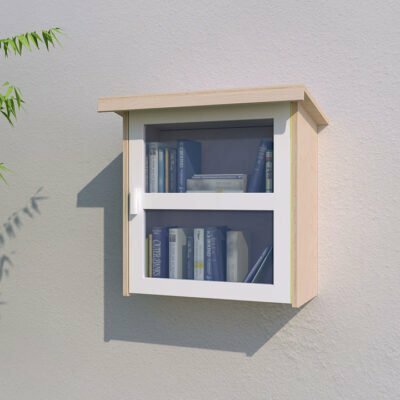 At the start you’ll find a list of necessities, such as the wood (board or sheet material), screws (size and quantity), glue and any other parts. 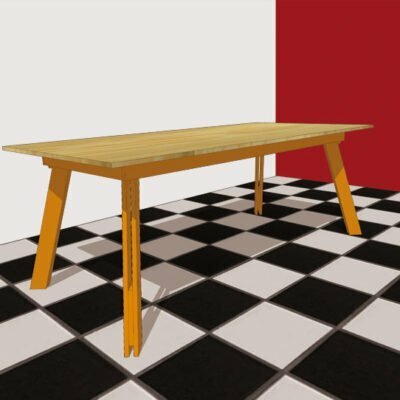 Also listed are the tools that you will need and a cutting list with dimensions of all the parts that make up the piece of furniture. 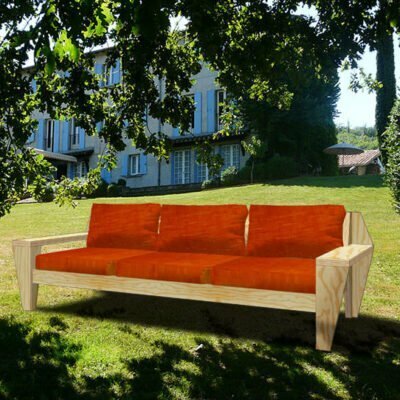 Outdoor sofa Yelmo also has a cutting plan, which shows the most optimal way to cut the individual pieces from standard sized boards. 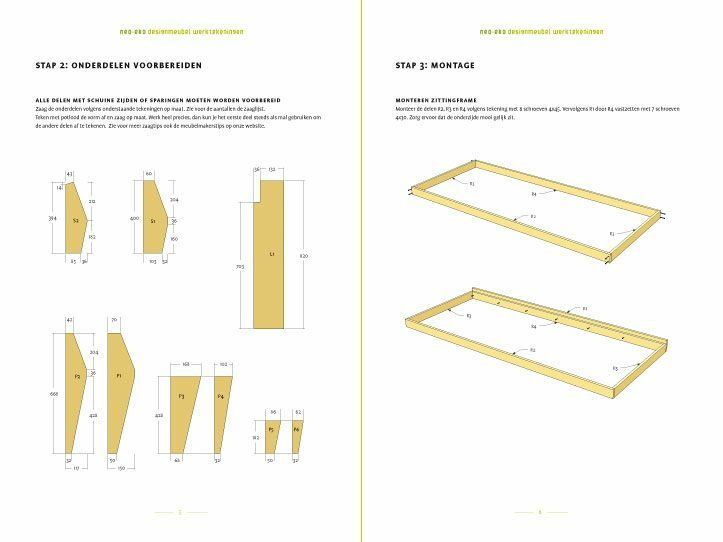 Finally, there is a detailed step-by-step plan for the construction of the furniture, with clear diagrams and simple explanations. Hieronder zie je drie pagina’s uit de werktekening. 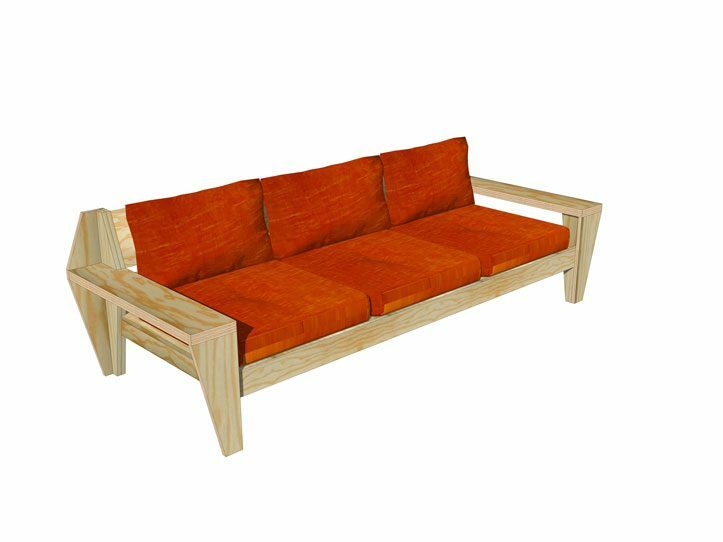 Below you can see three example pages from the furniture plan of lounge sofa Yelmo. Our plans are complete and proven. 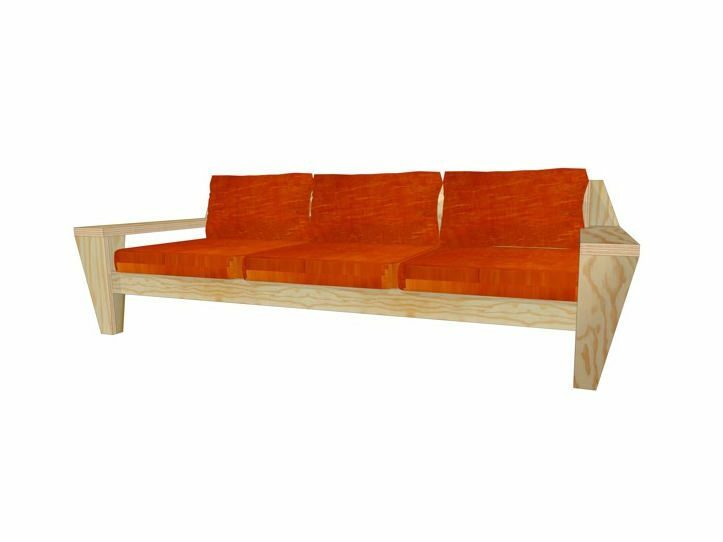 From an experienced carpenter or woodworker to an enthusiastic DIY’er with basic skills, you can now build yourself an original lounge sofa. Length225 cm x Depth 81 cm x Height 67 cm B 225 x H 67 x D 81 cm. You can do it (too)! 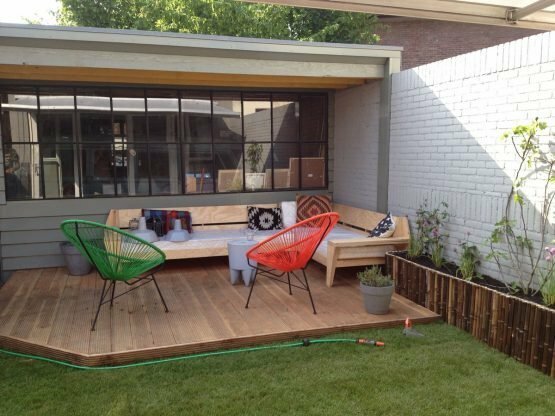 The design takes account of the capabilities and limitations of the DIY’er and their tools.